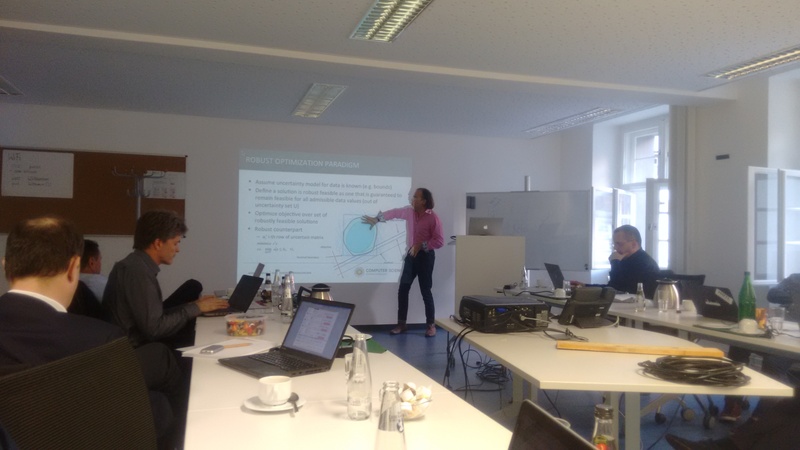 On 22nd April 2016 the 11th Experts Talk on Next Generation Service Delivery Platforms (NGSDP) was held at the Telekom Innovation Laboratories in Berlin. The purpose of the event is to bring together thought-leaders in the area of Next Generation Services to discuss the state of the art in the field. This time the topic was “Network Slicing and Next Generation Service Programming Approaches for SDNs in 5G”. SDN and NFV leverage advantages of cloud computing for networking. These technologies form a keystone for the next generation mobile networks (5G) and as they are rapidly maturing, this event provides a platform to present state-of-the-art solutions, discuss the emerging challenges and define new directions in this field. This event brought together experts from both, academia and industry focusing on 5G, NFV and SDN from different perspectives, eg. from a perspective of underlying cloud infrastructure, service orchestration, service component placement optimisation, vehicle to vehicle (V2V) communication platforms, etc. A key aspect of 5G networks is to enable logical network separation – network slices, which can be delivered in the as-a-service fashion. Different network slices can be optimised to accommodate various types of workloads. For example, machine-2-machine (M2M) communication requires very low end-to-end latency, while video streaming services will be more demanding in terms of bandwidth and throughput. To achieve this, SDN and NFV are a great fit – using advanced orchestration techniques which are aware of the network slice workload results in more efficient VNFs placement and chaining. We were quite impressed with the range and number of fairly advanced (federated) 5G testbeds all around the Europe and this number will sure increase significantly within this year. Berlin was particularly noteworthy, developing an experimental 5G framework which targets and supports its vibrant startup scene. We presented our current work on NFV orchestration on CloudStack carried out under a Swiss KTI project – ACeN, in cooperation with our industry partners Exoscale and Citrix. Virtual network functions (VNFs) are a backbone for SDN and 5G networks. Delivering VNFs as-a-service enables complex services to be delivered on demand, very cost efficiently and across different cloud domains. While OpenStack has emerged to be a frontrunner in the area of open source IaaS solutions, increasing heterogeneity in terms of both, the type of virtualised HW resources (GPUs, FPGAs) and virtualisation technologies (containers, unikernels) will require more diverse platforms to be capable of hosting NFV workloads. We presented our work on prototypes for delivering Load-Balancing-as-a-Service, VPN-as-a-Service and IMS-as-a-Service using our very own orchestrator – Hurtle on the CloudStack platform and discussed the importance of being aware of other cloud platforms in the context of 5G – it’s not all about OpenStack, you know! More information about the event and slides can be found here. 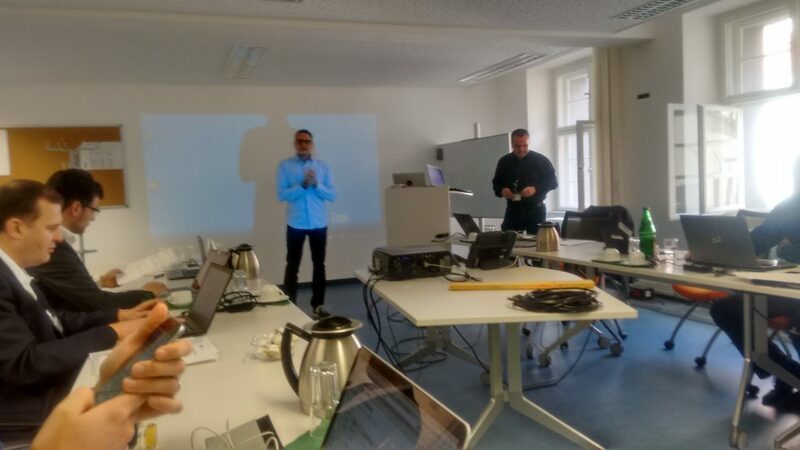 We would like to thank the event organizer and the host – Frauenhofer FOKUS institute and T-Labs, Berlin, namely then to Prof. Dr. Thomas Magedanz and Hans Einsiedler, for the opportunity to participate. We would like to thank all the speakers & participants for the enlightening event filled with exhilarating talks and we are looking forward for the next one! This entry was posted in *. * and tagged 5G, ACeN, CloudStack, hurtle, NFV, NGSDP, orchestration, SDN by cima. Bookmark the permalink.